You can put your comments below and I’ll do my best to respond, as the opportunity arises. Best of luck! A faucet you need special goggles to see ? Love the clue! You’re also right! An antelope? With an extraordinary nose, so a saiga? Decidedly morokanth… but which one? I’d say tapir, but I wouldn’t dare to actually specify which species without a good reference collection, particularly since – it being the Grant collection – it might very well be one of the extinct ones, which limits the use of internet as identification help. Don’t want to give it away! But, I loved that first scene of Kubrick’s “2001: A Space Odyssey”, where the primitive man-apes coexist peacefully with a herd of these nose-ey critters, until the Monolith tells the apemen to pick up a weapon and bludgeon one of these guys to oblivion, thus iniciating human culture. As you do. You know what, I had completely forgotten that part of the film! In my hometown’s zoo back in Venezuela, one of these guys (the local name is “danta”) was kept in an enclosure around a big lagoon where a manatee also lived. The two struck up a deep friendship, and followed each other around all the time, very cute! Let’s see if I can come up with some pointers, without giving away the answer. There’s no scale bar, but the background of the image makes it obvious that it’s something pretty big. I usually look at the teeth first, and two things immediately strike me about the teeth of this animal. Firstly, there’s a large gap between the cheek teeth and the incisors at the front – that generally means we’re looking at a herbivore. But, secondly, I notice that it has incisor teeth in both the upper and lower jaw. 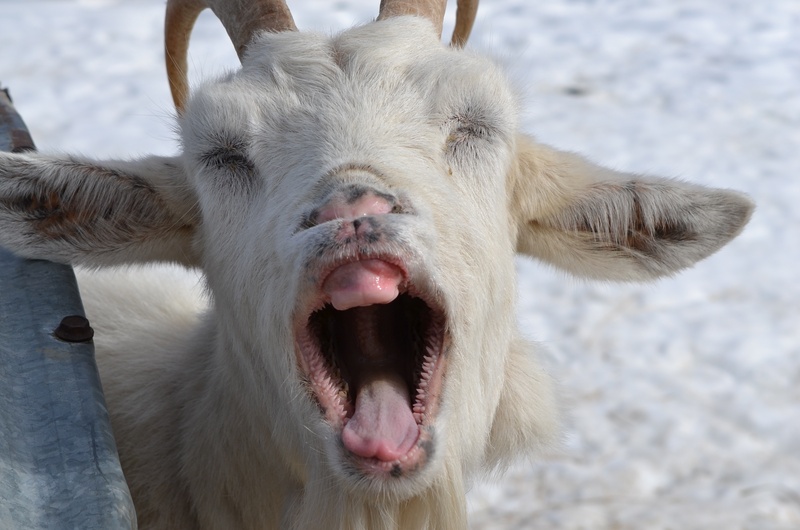 That’s pretty unusual for a big herbivore – ruminants don’t have incisors in the upper jaw (see http://edenhills.files.wordpress.com/2011/02/meg-yawn.jpg for example), and most big herbivores are ruminants, including all the ones that have true horns or antlers. So, given that it’s obviously not, say, an elephant, what are we left with? The clue, as you’ve spotted, is that spiky thing on the forehead. Nothing has a horn there, so it must be something else… work out what, and you’ve probably got your animal. Hope that helps! Thank you, Jamie! Now I have some ground to stand on. A few FMOs ago I identified some teeth. I now think those teeth would have felt right at home in this individual’s head.